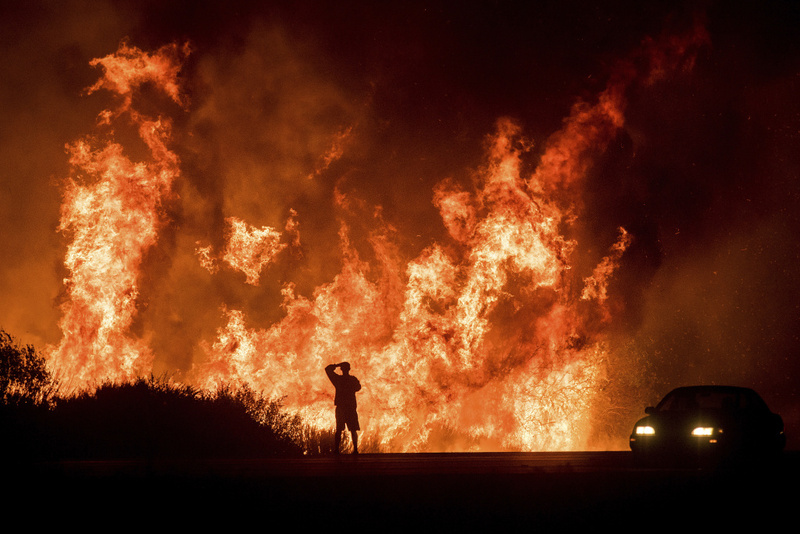 In this file photo, a motorist on Highway 101 watches flames from the Thomas fire leap above the roadway north of Ventura, Calif., on Wednesday, Dec. 6, 2017. Fire crews have now fully enclosed the largest wildfire ever recorded in California. The Thomas Fire ripped through more than 440 square miles of Ventura and Santa Barbara counties, killing two people, destroying more than 1,000 structures and damaging 280 more. It is now 100 percent contained but has yet to be declared fully extinguished after burning for nearly 40 days. The fatalities included a firefighter and a civilian who was found dead in her car, having crashed along an evacuation route. The fire, sparked Dec. 4, was fueled by fierce Santa Ana winds and extremely dry conditions, defying the efforts of crews in the air and on the ground, jumping the 101 Freeway and pushing relentlessly day by day until it looped back on itself in a massive rough-edged ring, with the resort town of Ojai in the middle. It devastated several foothill and seaside communities and stripped vegetation vital to the integrity of the hillsides, leaving wide swaths below vulnerable to the mudslides that would ultimately hit earlier this week in the season's first heavy rainstorm. Officials say the fire was unprecedented. Of the top 20 largest wildfires recorded in California, it is the only one to occur in December. Firefighters during the Thomas Fire in December 2017. Full recovery will take time. Fire and forest officials estimated that it will take at least a season of regrowth — and potentially up to five years — for vegetation to fully grow back. In the meantime, areas below the burn zones that escaped this week's mudslides are still at high risk for flooding and debris flows in future storms. Forest closures within the burn area remain in effect until authorities have deemed it safe for the public to return. Sage Hill Campground is also temporarily closed while fire crews use it as a base camp. The cause of the Thomas Fire is still under investigation. In total, the state saw more than 9,000 wildfires last year, burning a total of more than 1.2 million acres, or 1,950 square miles. Cal Fire's firefighting costs hit a record high of $702 million — and that figure could rise considerably before the end of the 2017-2018 fiscal year. "The amount that's been used this fiscal year shows the extreme severity of wildfires that we are experiencing here in California, with our changing climate," Cal Fire's Daniel Berlant told KPCC. That $702 million total tops that from any previous year, even after adjusting for inflation. Cal Fire's budgets capture the fiscal year beginning every July 1. The agency's Emergency Fund pays for firefighting within its areas of responsibility. Those costs have been rising in recent years, as firefighters burn through ever-greater sums battling blazes across the state. 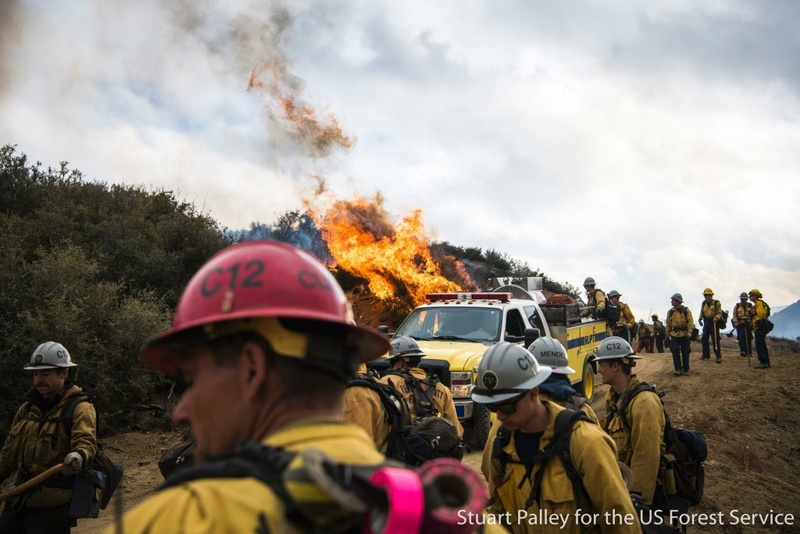 "This is the money over and above our regular operating budget to mitigate the significant and deadly wildfires in California," Cal Fire's Scott McLean said. The previous record mark was set in 2014-2015, when Cal Fire spent more than $600 million for the first time. What will the Thomas Fire burn zone look like in the future? What does 'containing a fire' really mean?